Did you know that most culinary herbs are jam-packed full of health benefits? 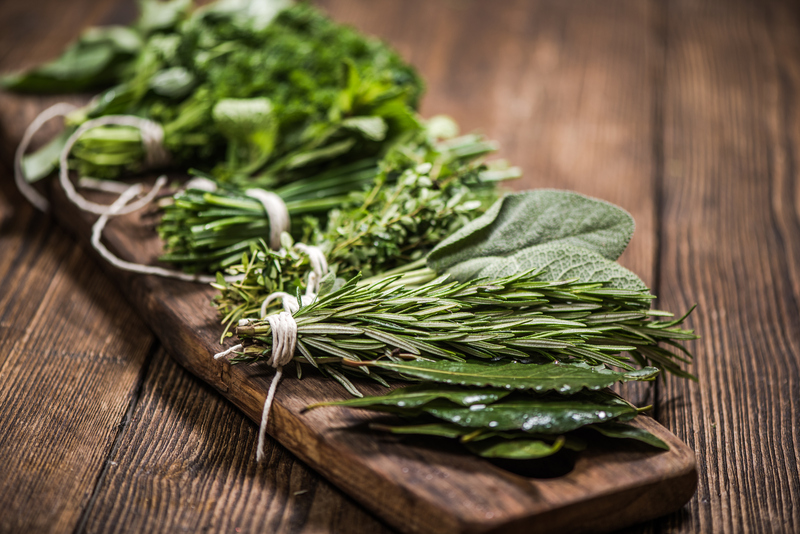 Learn how cooking with herbs can ramp up your health. 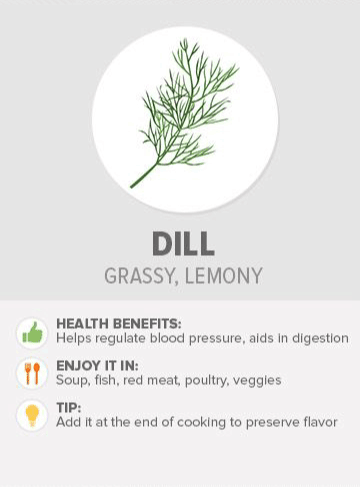 You probably use a variety of herbs every time you cook. 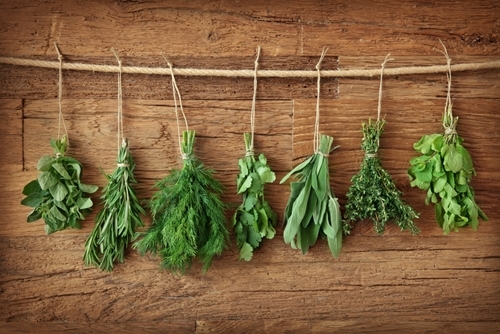 Most of us add fresh and dried herbs to our dishes simply for the wonderful flavor and aroma they bring. But did you know that they have a bounty of health benefits packed into them, as well? From fighting pain to protecting our bodies from free radicals and even parasites, these culinary plants pack quite a punch when it comes to our health. Growing your own herbs indoors or outdoors is easily achieved and gives you control over the quality of soil as well as the type of food that goes into your plants. If growing your own sounds like too much work, most grocery stores carry a wide selection of fresh herbs to choose from. As always, be sure to purchase organic. It can be hard to reap the benefits of herbs when we often only use a small amount. Next time you are making a smoothie or juicing, add fresh spices just like you would other greens to ensure you get all the benefits. Read on to discover more about some common culinary plants, as well as a few new ones you might want to add to your next recipe! 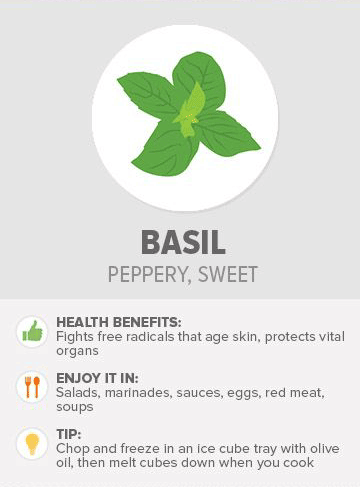 Health Benefits: Not only is basil delicious and very easy to find in your grocery store, but this amazing herb is also terrific at fighting free radicals (pollution, UV rays, smoking) that can prematurely age our skin. Because of its high antioxidant content, basil can be useful for protecting vital organs like the brain, heart, and liver, as well. 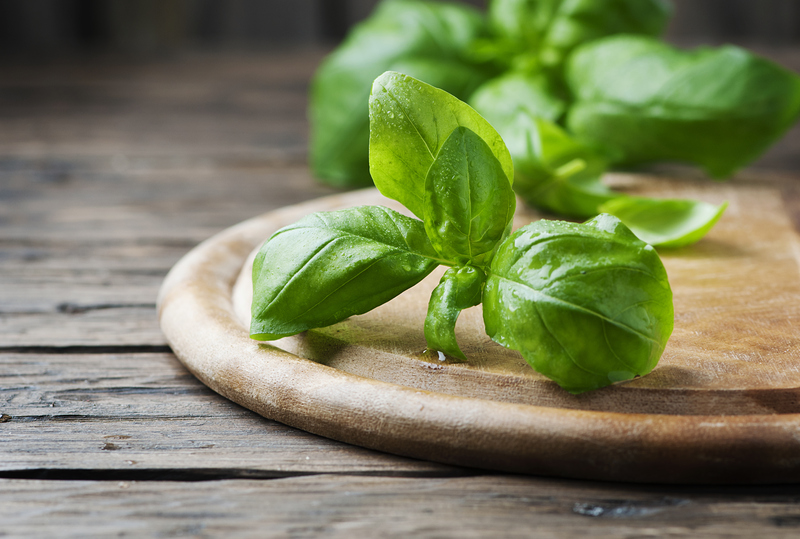 You can chop fresh basil leaves and add them to salads, marinades, pizza, pasta — and even infused water. One of my favorite ways to use up fresh basil is to create a simple paleo pesto sauce. Enjoy it in: Salads, marinades, sauces, eggs, red meat, and soups. Tip: Chop and freeze in an ice cube tray with olive oil, then melt cubes down when you cook. 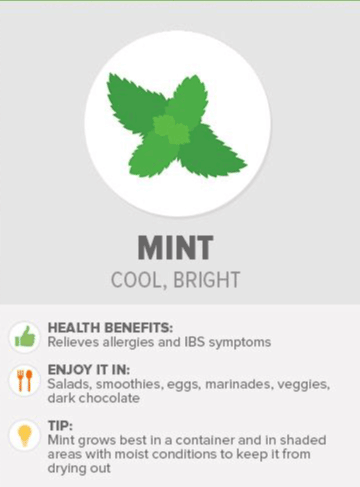 Health Benefits: Mint is the perfect herb to chop up and toss into dishes, known for its bright, balanced flavor and uplifting aroma. This leafy green is popular in many cultures, especially Mediterranean and Middle Eastern cooking. 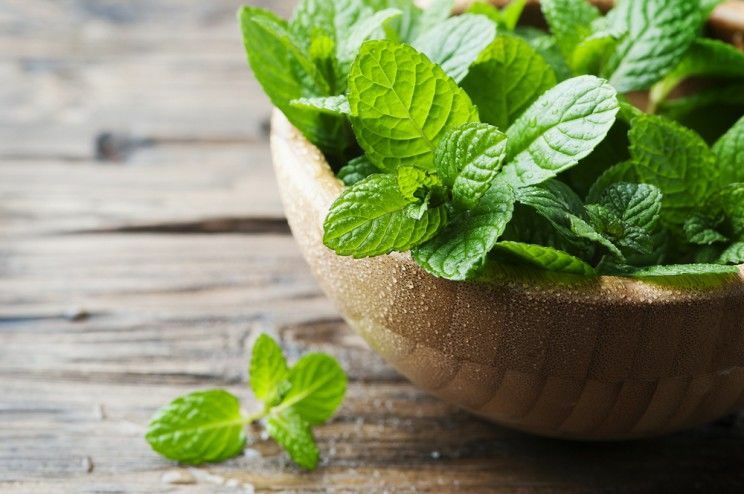 The flavor of mint is delicious in tabouli salad, smoothies, sauces, as a tea, and even in cocktails (mint mojitos, anyone?). This powerful herb contains some of the highest amounts of antioxidants of any food. These antioxidants are useful for naturally relieving symptoms associated with allergies and IBS. Enjoy it in: Salads, smoothies, eggs, marinades, veggies, dark chocolate, and mocktails. Tip: Mint grows best in a container and in shaded areas with moist conditions to keep it from drying out. 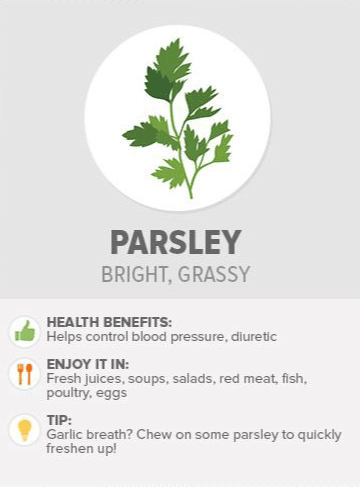 Health Benefits: Parsley is an unassuming herb with quite a list of impressive health benefits. This versatile herb contains folic acid, which can help to protect blood vessels — an important role which assists in fending off stroke and heart attack. Don’t just use this herb as a garnish — chop up fresh parsley and add it to salads, sauces, and burger patties to get a dose of its antioxidants. 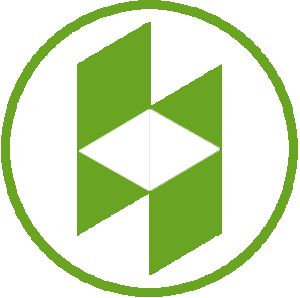 Its rich chlorophyll content is terrific for eliminating bad breath. It also works to deodorize the body from the inside out because of its antibacterial properties. Enjoy it in: Fresh juices, soups, salads, red meat, fish, poultry, and eggs. Tip: Garlic breath? 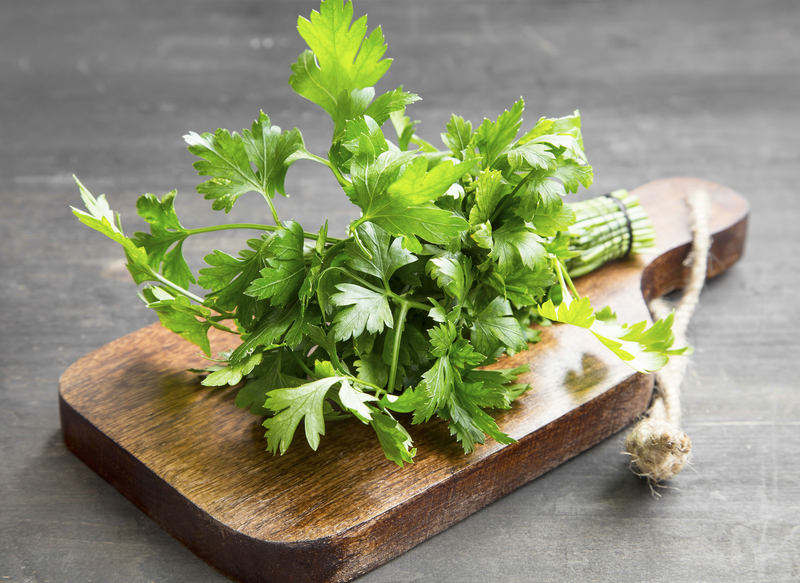 Chew on some parsley to quickly freshen up! Health Benefits: Cilantro is a very popular herb that complements the flavors of Latin dishes. 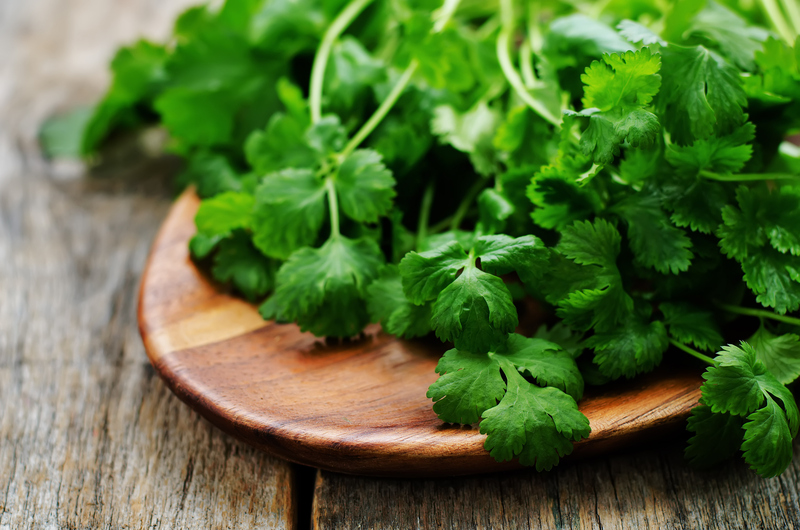 One of cilantro’s most talked-about benefits is its ability to cleanse our bodies’ tissues of toxic metals. These metals get into our bodies via the food we eat, smoking, deodorant, and even our water supply. 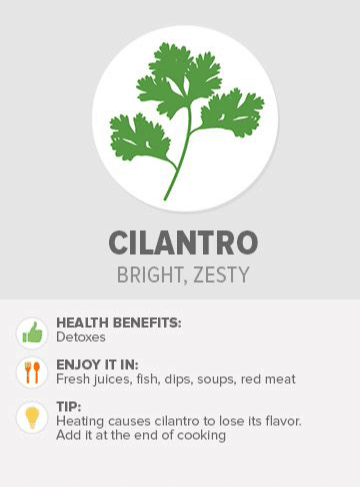 Not only is cilantro helpful for cleansing our bodies, it also gives important nutrients to our bodies, including vitamins A, C, and K, and minerals iron, potassium, calcium, and manganese. Enjoy it in: Fresh juices, fish, dips (like guacamole), soups, and red meat. Tip: Heating causes cilantro to lose its flavor. Add it at the end of cooking. Health Benefits: This wispy green is known as a very functional food. Its high mineral content of copper, zinc, potassium, iron, and magnesium helps regulate blood pressure and aids in digestion. Dill also provides a dose of free radical-fighting antioxidants. Enjoy it in: Soup, fish, red meat, poultry, and veggies. 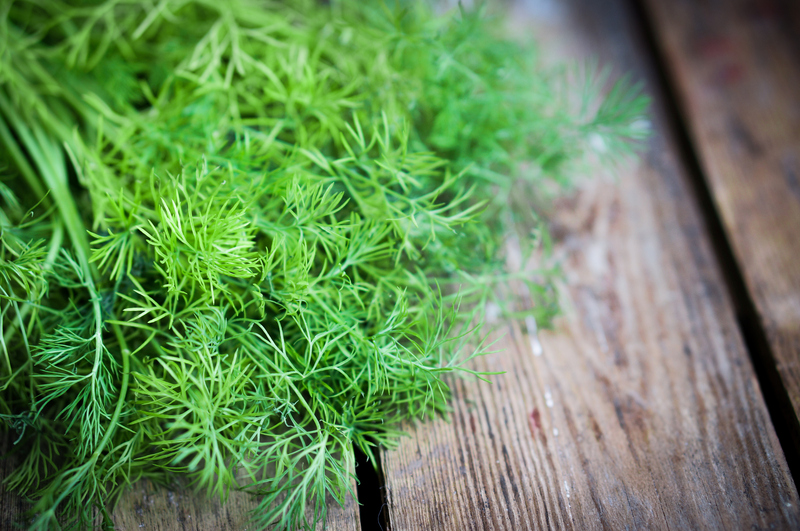 Tip: Dill is heat-sensitive, so add it at the end of cooking to preserve its flavor. 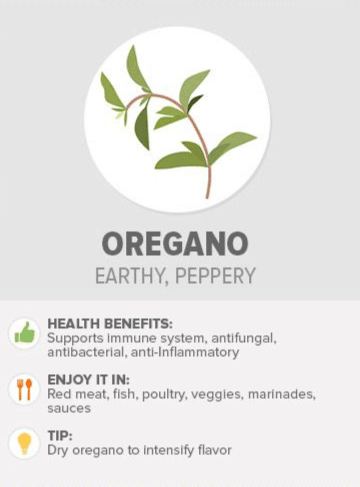 Health Benefits: Oregano has one of the highest antioxidant ratings of any herb. It contains rosmarinic acid, a strong antioxidant compound terrific for fighting disease. In addition, the small leaves contain carvacrol and thymol, two powerful antimicrobials great for killing foodborne pathogens and MRSA. Enjoy it in: Red meat, fish, poultry, veggies, marinades, and sauces. Tip: Drying oregano intensifies its flavor. 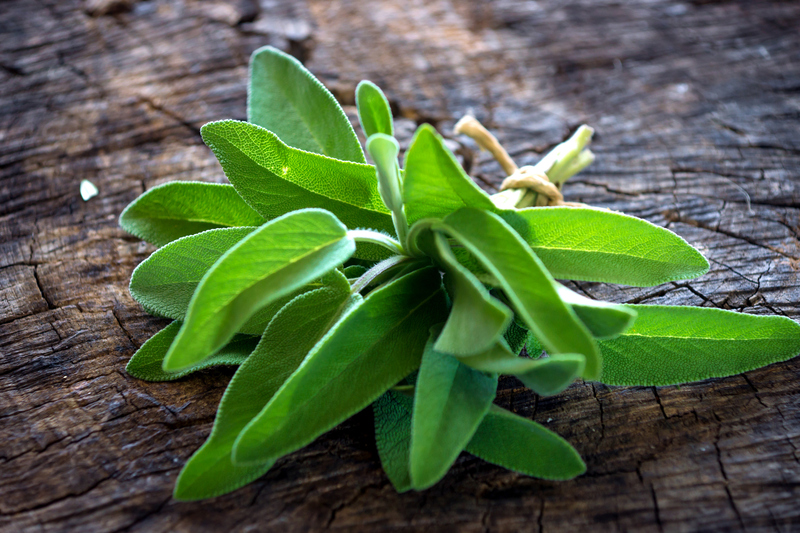 Health Benefits: Much like oregano, sage contains powerful oils which are useful for calming inflammation in the body, aiding in digestion and relieving depression. 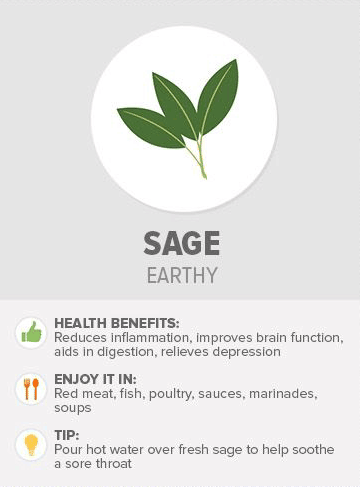 For a brain boost, cook with sage to improve memory and cognitive function. 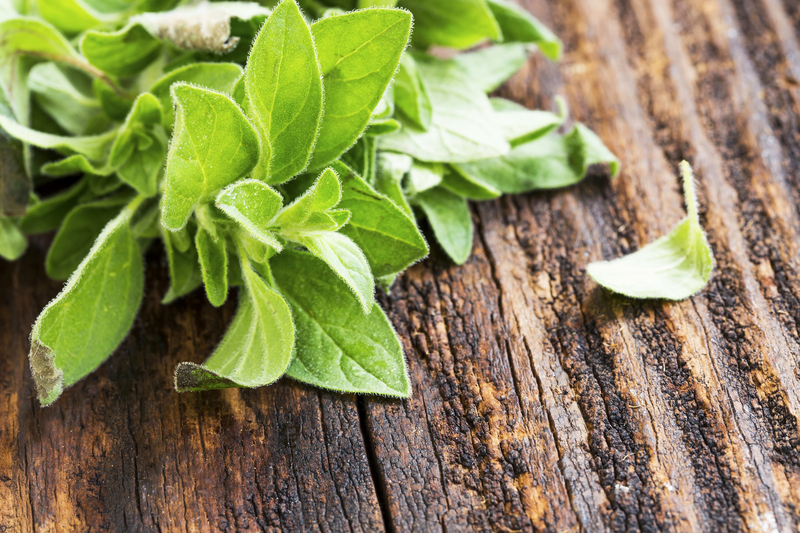 This Thyme and Sage Syrup can help with throat infections and dry coughs. Enjoy it in: Red meat, fish, poultry, sauces, marinades, and soups. Tip: Pour hot water over fresh sage to help soothe a sore throat. Wrap fresh greens in a damp paper towel, place in a Ziploc bag in the refrigerator to keep fresh. Store lavender away from moisture and heat. Store ginger and turmeric in the freezer and grate into dishes. If using fresh, remove skin and chop or mince.